It’s spring at WDW and that means it’s time for the flowers to come out. One of the things that sets Walt Disney World apart from all the other theme parks is its beauty. WDW is always perfectly manicured; beautiful flowers are always all around the whole resort. This month we are going to feature the Flowers of Walt Disney World to help celebrate springtime at WDW. We start off with a look at the plants of WDW, followed by a look at the Flower and Garden Festival, along with the Behind the Seeds Tour. 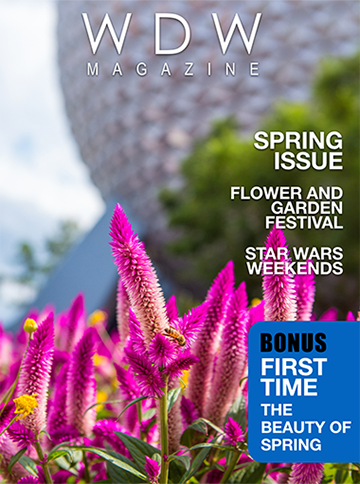 Later in the issue we look at the Gardens in Epcot as part of our Fun and Free section. In Helping Hands, Dave talks about renting strollers and Kathleen visits Crystal Arts and looks at the Glass Blowers. Our Bring The Magic Home this month Lisa shows us how to create our own topiaries. How cool is that? We have another special section this month about the upcoming change of Downtown Disney to Disney Springs. It’s going to be a fun ride. There is more to enjoy this month so dive right in. Let’s start celebrating spring at Walt Disney World.